Saturday April 25th at 2p.m. 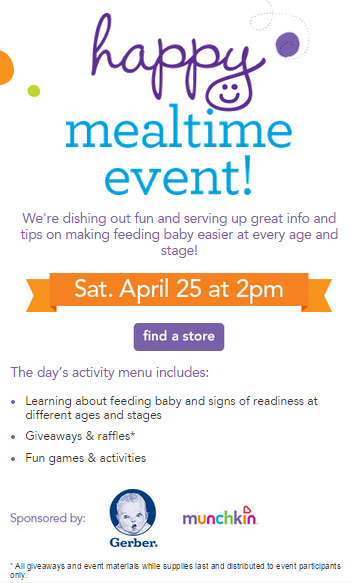 at participating Babies R Us, a baby mealtime event! Learn about feeding your baby, signs of readiness at different ages and stages, giveaways, raffles, fun games and activities! Get excited from April 20-24, follow @BabiesRUs on Twitter every day. Share mealtime advice using #BRUHappyMealtime and be automatically entered for a chance to win prizes!